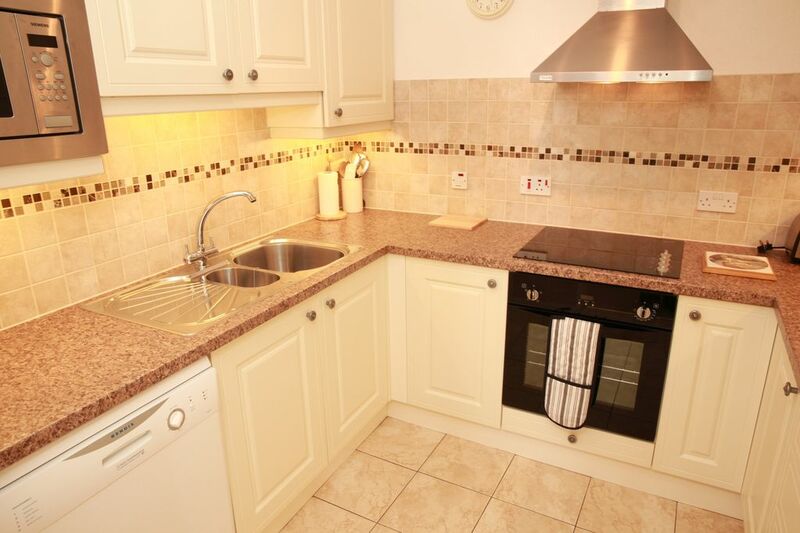 Very spacious, comfortable, ground floor apartment level throughout in the grounds of The Osborne Hotel. Lounge has dual aspect windows with fantastic sea views. Hesketh Health Club Facilities available, including Indoor Swimming Pool. Day pass £10pp Weekly £35pp Children £5 per session to be accompanied by an adult. Hire of Tennis Court. All payments to be made directly to the Health Club. On arrival, to help you relax after that long journey, complimentary tea, coffee, sugar & pint of milk. Please check rental rate for a 7 night stay as it might not show up correctly. Easter is not far away offering £50 off weekly rate on 7 night stay from Sat 13 - Sat 20 April & from Sat 20 - Sat 27 April 19. This will be adjusted on booking request. On road parking just outside the gated entrance to Hesketh Crescent. About 100 metres from the apartment. Cooker, hob, oven, fridge/freezer, dishwasher, microwave, washing machine, tumble dryer. The location is beautiful and peaceful overlooking the sea. The apartment itself is elegant and extremely well equipped, whilst also being very comfortable and cosy. Four of us spent New Year there and explored the surrounding area. Thoroughly enjoyed our break in this beautiful part of the UK. A beautifully clean apartment with amazing views of the sea. Very well equipped and a real home from home. A hidden gem, we will be booking to come again! Thank you for your kind comments which are very much appreciated. Delighted that you had an enjoyable and comfortable stay at our apartment and very much look forward to welcoming back for another stay in the future. This is the most beautiful apartment in the perfect location. spotlessly clean with everything we needed for a family holiday. A great spacious apartment to relax & chill out on a rainny day, looking at the beautiful sea views. We arrived to fresh flowers & a bottle of wine. There is a beach cafe with brilliant views for snacks & light meals within a short walk. Also steps down to a sandy, cobbled beach & toilet facilities on the beach. The apartment is attached to a 4 star hotel where we had some lovely meals. You are welcome to go with the children in the evening & have a drink or afternoon coffee there. We all played tennis, this is available to hire at the hotel. The children enjoyed playing on the slides & swings. There is a pool you can use in the hotel which we did use each day but it does cost £34.00 per DAY to use this for a family of 4, which we didn't mind. The gym is extra £5.00 a day it isn't included in the price of the swim. In the summer this would be a perfect holiday apartment on the beach with an outdoor pool, looking over the sea - amazing. We stayed at Easter, we had 2 stunning days with weather and the rest were windy/raining but the apartment is so stunning we were happy to sit around relaxing playing board games. Our children loved staying here & have said they would loved to go back again one day. Thank you so much for your very kind comments. I am delighted you had an enjoyable and comfortable stay at our apartment and very much look forward to welcoming you back again in the future. The photos of this apartment do not do it justice. Spotlessly clean, very roomy, peaceful. Lounge is enormous with beautiful high ceilings and all furnished in keeping with the building itself. Everything we needed and more in the apartment. Fantastic views of the sea from all the lounge windows and the master bedroom window. Lovely comfortable beds. perfect piece of heaven for a base if you want to see the sights or just to get away from it all. The sea is so close it takes no time at all to do the delightful walk to the quiet promenade. Feeling more energetic, take a stroll over the cliff tops to Torquay and take in the amazing views along the way. We stayed for a week but could very easily have stayed for a lot longer, the apartment is so comfortable. We usually start our holiday by cleaning cutlery, work surfaces and toilets, absolutely no need in this apartment we arrived unpacked and started to enjoy our stay immediately. It felt like our own piece of heaven. Not the cheapest apartment available but definitely worth every penny. We would definitely stay here again would not even look at another apartment in Torquay this was so perfect for us. Water sports available were great for our two boys age 16 and 10. We were welcomed by Sarah who showed us around and asked that we phone her any time if we had any problems which we did not. Booking Notes: 30% non refundable deposit is required at the time of booking Balance of payment and the £150 security/key deposit it due 6 weeks prior to stay. Security/key deposit will be returned with seven days after your stay. Breakages or damage to apartment will be deducted. It is advised you obtain Holiday Cancellation Insurance Changeover Day: Saturday - July & August Other times of year we can be flexible with last minute breaks Short breaks available min 3 nights - Please enquire 07870655880 Day of arrival entry to apartment normally 2pm but an earlier time can sometimes be arranged on request. The cost of a 3 day short break will be from £375 Should you require any further information please do not hesitate to call 07870655880 You can either book through Owner's Direct online booking system or with Sarah the Owner direct There are no further Owner's Direct charges.